Download the pdf version here (EN). 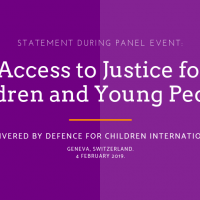 Defence for Children International (DCI) thanks the organisers for this timely event and welcomes the opportunity to share some information. Access to justice for children has been the core part of DCI’s activities since we were established in 1979 and remains a much-neglected issue in the international arena. It is also priority 1 of DCI’s Strategic Framework 2017-21, as well as directly linked to the Global Study on Children Deprived of Liberty; DCI is co-convenor of the the NGO Panel grouping more than 165 NGOs supporting the Independent Expert, Prof. Manfred Nowak. In this context, we thank the Core Group of states for focusing on access to justice for children and young people today. DCI sees this as an opportunity to implement concrete follow-up to the 2014 Annual Day on the Rights of the Child during the 25th session of the Human Rights Council when this was the focus topic, and related resolution of the Human Rights Council on Access to Justice (Res. 25/6). Access to justice goes beyond the juvenile justice system. It involves developing child protection systems, to prevention, rehabilitation and empowerment projects for child victims of violence, as well as fighting against gender discrimination, empowering children as actors and advocates of their rights. A justice system adapted to children must be established to guarantee a human rights-based approach. The Committee on the Rights of the Child is in the process of updating its General Comment on children’s rights in juvenile justice (GC10). This will provide a framework for ensuring access to justice for children. Furthermore, in recent years, models for child-friendly justice have continued to develop. A child-friendly justice system guarantees child participation and ensures that children are consulted and heard in all proceedings involving or affecting them, and that their best interests are of primary consideration. Information and advice on their rights, the justice system, measures available, and similar issues, are provided to children involved in the different justice systems with which they come into contact. It is also important to ensure that their right to privacy is guaranteed with regards to court records and documents containing personal or sensitive information about the child. In this year of the 40th anniversary of DCI/ 30th of the UNCRC, and the presentation of the Global Study to the UN General Assembly (October), we look forward to collaborating with the Core Group on this important issue.